House of Floyd is San Francisco’s immersive Pink Floyd tribute band. Rather than simply replicating the iconic band’s recorded songs, House of Floyd focuses on the adventurous live arrangements and sonic explorations of their namesake. 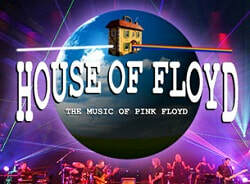 Built around the jam-based interpretations and engulfing sound effects and visuals that made Pink Floyd’s live sets so popular, House of Floyd delivers serious musical magic: stellar musicians, the legendary films and tape effects, surround sound, atmospheric lighting, lasers, fog, and all that hypnotic Floyd. If a show is Reserved Seating - that means you can chose your seat from the seating chart. Wheelchair seats must be purchased through the ticket office.